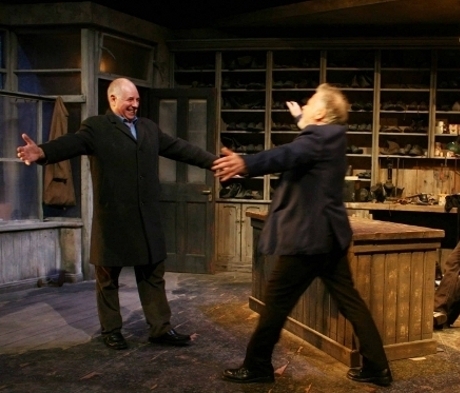 Billy Roche's rousing comic play The Cavalcaders explores the lives and loves of a community of characters in small-town Ireland. Set in an old-fashioned cobbler's shop, this is the story of four shoemakers who make the mundane marvellous as they transform themselves nightly into The Cavalcaders, a singing quartet that prides itself on harmony, comic patter and romantic sentiment. The play blends music and comedy with a brutally honest depiction of emotional warfare and personal betrayal as we witness the group, and particularly its leader Terry, disintegrate before our very eyes. For, hidden behind the harmony, lies discord as treachery, betrayal, guilt and sin lurk in the shadowy corners of their lives. Exploring the complexities of human relationships, The Cavalcaders is a wonderful memory play with live music and a beautiful musical score that is both moving and entertaining, written by renowned Irish playwright Billy Roche, author of The Wexford Trilogy. "A play filled with sparkling dialogue and lively incidents." - Michael Billington, The Guardian. "What Roche is really good at is depicting small-town life in his rural Ireland." - Philip Fisher, British Theatre Guide. Spokeshave - Calling all Leaving Certers!